During last few decades, I have noticed that, diseases related to stress and life style have increased tremendously. Occasionally I have also experienced the same but analysing the 'Mind-health synchronization': I am overpowering them. Actually, stress related diseases first originate in one's mind then affect physically. It's our belief system, attitudes, habits or situations that lands us in mental instability results in poor mental health. And can cause multiple aches like regular insomnia: a sleep disorder, lethargy: a fatigue syndrome, or obesity, where no many times physical cause is detected. All of these have direct impact on mental, social, and physical health, due to which a series of hormonal changes occur. Many endocrine glands in the body get disturbed includes thyroid, parathyroid, adrenal, ovaries, testis, pancreas, pituitary and hypothalamus. It also found that stress also affects autonomous nervous system disturbing bodily functions like digestion and respiration, deteriorating our health. Need to control over this, we have to check out for our cortisol levels. Cortisol is a ‘stress hormone’ that our bodies release in response to anxiety in mind; over prolonged periods, higher cortisol levels have been linked to a wide range of health derangements like heart disease, high blood pressure, diabetes, a lowered immune response, arthritis and various other diseases including depression. Apparently our mind can make one sick or speed the healing process by stress management: poor or good, correspondingly. It's important to note that "mind" is not synonymous with brain which we often think to be same. Instead, the mind consists of mental states such as thoughts, emotions, beliefs, attitudes, and images. The brain is the hardware kind that allows us to experience these mental states. Each mental state has a physiology associated with it—a positive or negative effect felt in the physical body. For example, the mental state of anxiety causes you to produce stress hormones. Our thoughts, feelings, beliefs, and attitudes can positively or negatively affect our health and body. Now we understand 'mind' plays a vital role in promoting or deteriorating one's health. On the other hand, what we do with our physical body: what we eat; quality and quantity, how much we exercise, even our posture can impact our mental state positively or negatively. Thus Mind and health synchronization is very much important to work on as both have an interrelationship between them. If we can strengthen this connection positively and understand it, we can conquer stress and related diseases. This can be achieved by empowering inner self by meditation and yoga like therapies as well as by paying attention to the inner world of thoughts, feelings, attitudes, visions to connect with the outer material world in better way and importantly, it will build up a good health and mind sync. 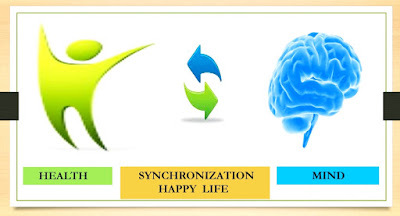 All of us can lead to a successful happy and healthy life by having a positive mind outlook that not only can improve quality of life but also give our health a boost and this is what 'mind and health synchronization'. Nowadays, What's app is successfully crawling the message of 'plastic ban' over an environmental awareness and I am sensibly happy for it because I have already implemented it, a year back. Though I am trying hard enough, it's really difficult to get out of this 'plastic world' completely. Plastics are synthetic polymers of organic origin and have enormous 'easy to use' properties like light weight, water proof , transparent as well as available with all colour shades, non-corrosive, easy to mold in various shapes and sizes, resistance to shock, low electrical and thermal conductivity, good durability, low cost, easy to manufacture and many more. Thus how we are addicted to the convenience of plastics and made them part of our everyday life: at home, work places, automobiles, construction areas, medical fields and other sectors. Eventually our convinient plastics are presenting many problems. As plastics are made from petroleum, a crude oil product by heating and catalysing the monomers like ethylene and propylene into polymers like polyethylene and polypropylene; which are not found in nature and thus there are no organisms capable of decomposing or degrading it over thousands of years, letting them polluting the environment at staggering rate. Beside this, plastics are flammable and can not be safely burnt releasing toxic chemicals in to environment which can be responsible for health hazards like cancer, birth defects, impaired immunity and many other ailments. Plastics are killing animals and birds as they eat plastics products by mistake.Plastics are also when seeps into water bodies like river and oceans, they adversely affect aquatic life as well litter up our beautiful shorelines. Coming to the solutions, landfill sites provided a good option where all the waste is gets desposed off and mostly of it is plastics. We produce millions of plastics every year and more than half of it goes to landfills as waste from all over the world, thinking as our planet is large one but it is not that large as we think it is. We are sharing it with billions of people, altogether contribute to plastic waste at an alarming rate and we can not escape from the consequences of throwing away that much of plastics which take hundreds of years to break down. Obiviously, it would end in making our planet as 'plastic planet'. So what are other options ? For the sake of a good environmental profile, we also have 3Rs :- Reduce, Reuse and Recycle, well known waste management programmes. Reduce is about cutting down the amount of waste that we are making. Example: Use washable dishes instead of paper plates and cups. Reuse means opting out different ways to use waste and avoid throwing it all put. Example: plastic cup and containers can be reused to store things or can become a part of art and craft projects. Recycle is a method of using the trash for remaking new products from it and using them again. Example: Having work places with recycling partner to collect and Recycle plastic products and we just need to encourage them. As we produce hundred millions tons of plastic every year, most of which can not be recycled or need effective recycling unit so it's obvious that we need to use less plastic, move towards sustainable products and services and come up with technology that recycles plastic more efficiently. Being more specific about plastics awareness, I like to turn your heads towards 'single use plastics' for now. 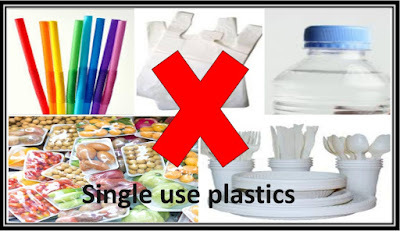 Single-use plastics, also known as disposable plastics, are intended to be used only once before they are thrown away or recycled. 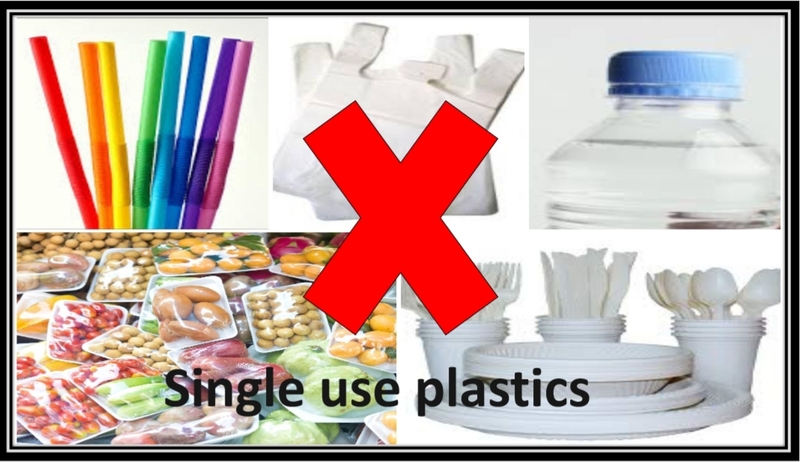 These includes plastic bags, disposable cutlery, bottles, straws, containers, coffee stirrers, soft drink and water bottles and most food packaging. Single-use plastic is everywhere. In a matter of mere decades, it has seeped into every corner of our lives. We think it’s normal to use a single-use plastic water bottles, take-away coffee cup, fruits, vegetables or other food products wrapped in disposable plastic packaging, and most popular 'a plastic bag' – but now we need to say big ' No' to them. You know, Fossil fuels (petroleum products) take millions of years to form, then they are mined and manufactured into single-use plastic items, and transported to us, simply to be used for a couple of minutes before being discarded into environment for nothing to do over next thousands of years. So here is point, protest the single use plastics to protect our environment for the future as we all have 'the power of revolution' and better knowledge of our actions, and their consequences. Hey parents, living in every corner of the mother earth; this is my thankful note to all of you, saluting to your selfless parenthood and I really value it from the bottom of my heart as I am also rooting for the same. A parent; mother or father is someone who willingly, always there to support and care her or his child with utmost unconditional love, patience and sensibilities. 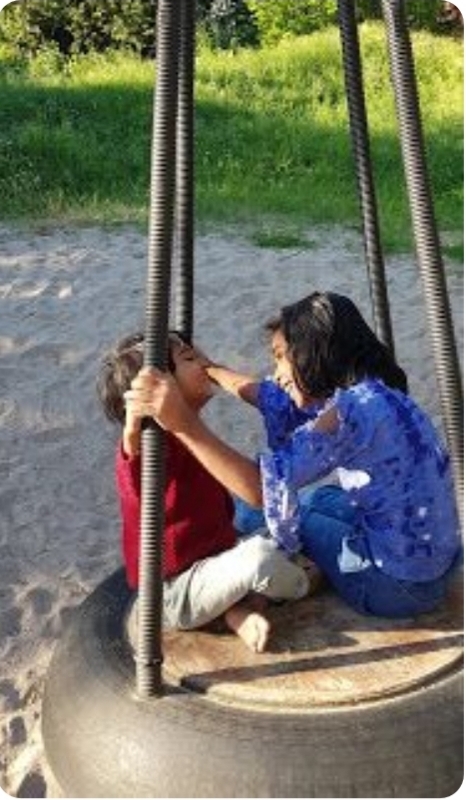 They come together as parents to upbring their kids from a completely innocent infant to a socially responsible person by providing them emotional, social, psychological, educational and financial support with ultra protection. They simply live to love their kids and thus are always above everything as their love is so unconditional that no one could replace it ever. The journey of parenthood is not simple at all. 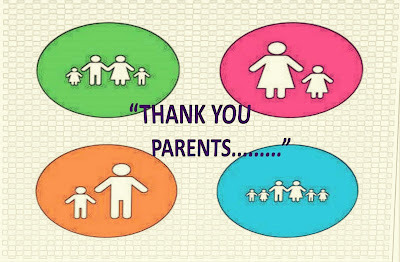 Only you, parents; know how do you all managing it selflessly with your own unique style. That's why I found it worthy to dedicate this simplest and not enough 'Thankful Note' to all of you. 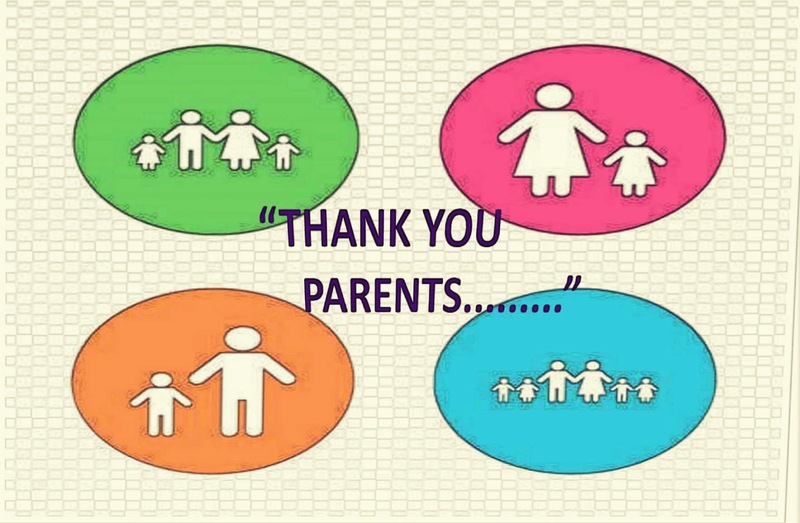 Though, parents never need any kind of appreciation from anyone, it might motivate many like me or who sometimes face routine troubles to deal with kids. Parents, you go through various kinds of resposibities while raising your kids with plenty of to-do and not-to-do lists at different stages of life. When kid is to be born, mother to be take care of herself, like never before and never after also, while father to be speeds up in gathering all strenghts, necessary to secure his kid's future. On arrival of baby, both of you, just dedicate yourselves pampering your young one as parents to be best. Sleepless night, half-eaten food plate, edging social life, ignored health care, anxiety about future, side lined career specially in mother cases..and many more issues just get vanish within a second, on 'one' smile of your kids...... How wonderfully this parenthood heals it's many worries with mere happiness of kids. Many times, being parents; you have to go through roller coaster ride of appreciation and critism regarding your parenting. Free advices and tips will never end, few being actually needed. Keeping moral values in head and monitoring your role play character in kids upbringing matters a lot. It's not difficult but not simple too because kids have their own way towards approaching every other situations and you are always there to guide, to appreciate and sometimes you even get angry with them to alert or seek good out of it; hoping kids will understand the case. And when kids grows up, you all need to be considerably flexible with kids in giving advice or making decisions. Your parenthood rewards to be proud that time when your kid respect your journey as a person and understand you as a parent with their affection and not just with their academical or social achievements. Me as daughter do admire my parents 'parenthood' but being parent of daughters I just salute their parenting as well as of all parents. "Parents, you all are priceless entities....."
Once upon a time, there was a man; living away from his family to earn livelihood. He was working hard enough to be rich soon. The only problem was: his phobia for 'loneliness' and even regular visits to family; living in neighbouring town didn't worked. On 'a good advice' of a friend, the man started socializing with neighbourhoods but being introvert; failed miserably. On the way; back to home, the man mistakenly took different route and while, wandering across a small lane, he found many scattered pages, nearby a locked house. He felt something extraordinary about them; might be their supreme quality or 'decorated' corner sides. The man instantly crushed over them to pilled up and brought home. 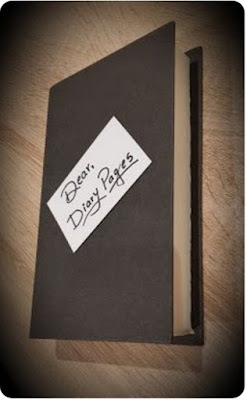 That 'very' night while moving fingers gently over the pages, he received a kind warmness and decided to adhere them into 'a diary' with a name, 'Dear Diary pages'. Day by day, the man started filling up the diary pages with his sweet and sour moments and felt lucky to have desirable companion who successfully faded out his loneliness. Getting, a very warm and affectionate treatment, unknowingly the dairy came to consciousness and began to wait for his admirer to write over her, every single thought of him. The man, now; increasingly became so fond of the dairy and started carry her almost everywhere....at work and also during his family visits. On, one of such visit, his family wished to accompany him soon. He accepted willingly. After a few days, his family arrived and the man seemed to be more happier. Though, he had managed the time between work and family, it became difficult for him to spend much time with the dairy that he use to spend earlier. The dairy kept waiting for her master, every day with same admiration but left ignored at the end. There after, 'the dairy pages' left cornered; heartbroken and alone, thus became unconscious over time. Few months later, the man's wife sold out the 'torn' diary with old newspapers without concern of the man. While going through rocky small lane in a small cart, some of the 'uninked' dairy pages got fall nearby the same house, from where the man picked up them. Next morning, another man located and gathered the dairy pages and welcomed to 'home'. Again, the dairy pages waked up to bit consciousness with the very 'familiar' touch of second man. She saw herself again as a dairy and a series of letters were inked over her. Dairy, regaining full memory; remembered actually she was belonged to the second man only. As this man use to spend much time with dairy pages, actually decorating them to write letters to his wife for an occasion of their marriage anniversary. But, being unaware; his wife threw the pages from window with the envy when the man was on tour and she left to visit her relatives. Returning from tour, the man became sad as he didn't find his pages but got busy in life with 'the hope'. Now, he miraculously found 'his pages' back. He summoned them to 'a lively diary'......full of praise and loyalty....to gift his wife who was coming to home after a vacation. Moral: True friend meant to share loyality and not just loneliness. Nature's beauty, often greet us, in it's own way. It rekindles our thoughts, to visualise and to enjoy every small cheer along with bigger celebrations; equally. Fortunately I have been just coincided with the same. 'Other' dawn awakened me with its 'chirping alarms' and I got on my toes to be fit. Running eastward, I was mesmorised to witness an eternal 'sunshined' dawn that kept me approaching towards it. Parallel to roadside; plenty of nature's oxygen generators were planted. They pumped up surrounding breezes too fresh to breathe and thus, made me to run for an extra meter. Soon afterwards, I opted to walk lazily and got accompanied by my best friends......'wandering thoughts'. Visualing scenic beauty; breathing oxygen-rich air; burning 'unhealthy' fats and being in best friend's company that all continued to enhance my positive perception towards life. Going back to home; I was glorified to sight at 'the universal symbol of affection' : the beautiful red rose. I stopped in admiration. Rose; being so attractive was a worth of watch. 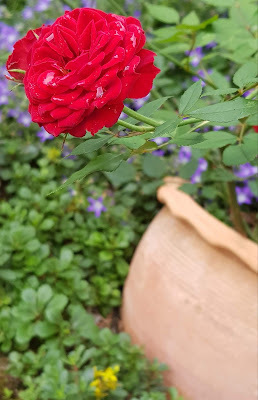 It had vibrant red colour, half opened petals; jewelled with shiny dew drops and sharing its space half opened bud. As it was emerged from prominent arm of potted mother plant, glittering with plenty of sunshine. And with fresh gesture; it seemed to greet me, "a very Good morning". Fascinated over 'magnificent rose beauty', I just glanced it's ground and background with much ignorance. Suddenly, I received another morning greetings with low utter. Though, I was not pleased, surprisingly looked at ground. I couldn't find any of delegates there and again turned my eyeballs for a glimpse of 'more emphasised rose'. 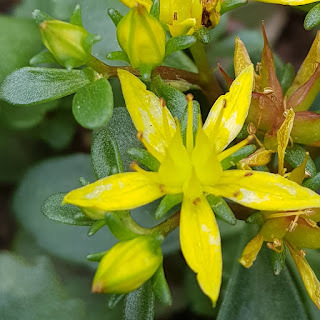 Close to the ground, on a short slender stem branch, that 'tiny' flower with colour of happiness; yellow, smiling towards me with much more please to get noticed. I lowered my posture for closer look of it. After a minute observations, I was delighted to see 'an unexpected beauty of that tiny flower'. Its petals were reflecting golden shimmer ...full of dazzling elegance. It left me with quite, satisfactory amusement. Indeed, this made my vision more cordial to coordinate nature's 'tiny flowers' greetings with life's small joy moments as both can appeal us with momentary yet delightful happiness that might make great difference in our approach towards life but we ignore them over bigger fascinated one. Life, regularly uploads the happiness along with odds. We keep focusing on the bigger 'cheer hours', neglect many of 'happy minutes' which can be equally valuable to manage life's 'ups and downs' more smoothly. belongs to my maternal grandmother. An oval wheatish face appeared on my phone screen; with wrinkled skin; sparse eyebrows; pointed nose; lips seems to shrunk like faded rose petals; grey hairs covered with part of unpinned, printed saree she wore .... 'My Granny'. A 78 years old deepened eyes twinkling with wisdom of experience seems to be confused where to look either in the front camera of phone or display screen. Obviously she chose later one, as she saw my smile on it and eagerly gave back 'most adorable smile' with a very familiar complaint that I don't call her on regular basis. She continued her talk; asking whereabouts of my daughters and life abroad. After answering all of her questions, finally I got a chance to ask about her health to which she replied with sigh "I have been weakened now days".... and sudden her facial expression murged to be pale. She ordered me "keep calling" and gave back phone to my sister. 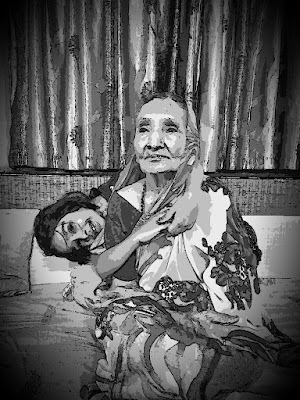 Granny got married at the age of mid thirteen to grandpa who had very impactful persona. Though, she use to look comparatively ordinary; her abilities of firm decision and caring approach made her 'a lady' behind all the success achieved by Grandpa. During childhood, I use to visit 'Granny's town', twice a year for vacations when she use to wore a well pinned up, ironed saree and looked very pretty. I do remember, many incident of that time. One of them; actually bumped me to know her name...... A prime time 'Drama serial' that my granny use to watch without missing a single episode led me in surprise when I found her with very much concern towards the main character....who was sharing her name with granny. I realised the value of having such 'wonderful grandmother' when my parents sent me to granny's place for higher studies and it was her encourement and support, helped me to became 'university topper' in my post graduation. I shared a very warm bond with her by that time. I do remember, she use to wait for me; to return from college peeping through window as like a mother of small kid, she made delicious food for me specially buttery chapaties, she guided and guarded me very well when needed. I also looked after her, by taking her on regular doctor visit, bringing her favourite milkshakes and juices, making calls for her and specially listening to her complaints genuinely. I am happy and excited to share these memories with my kids about their 'great' great grandmother. Picturesque landscape : with craggy 'rolling hills',sun-drenching 'fertile' valley along with gem-blue stream of soulful 'Rhein river' that all furnish to an attractive paradise to 'Ingelheim am Rhein', a town situated in Mainz-Bingen district of Rhineland-Palatinate, Germany. Now, it has been a month, I with my two daughters landed here, accompanied my husband, working for a well established pharmaceutical that gifted an industrial prestige to this 'Red Wine' town which altogether known for its world famous 'International Tage' : artistic exhibition orientated cultural festival that been regularly hosted by company since 1959. For the year of 2018, it will be held in month of August to October....to attend it; I and my husband super excited !!!!! 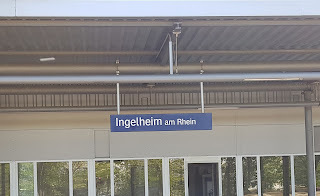 A month old residency to 'Ingelheim' led me know about several other aspects of town. The historical files are inked with name of Ingelheim; by later half era of 8th century, when the Emperor Charles, had an imperial palace erected on hill, high above the Rhein river which was one of the magnificent palace of that time and soon became a venue for imperial diets, lodging and conferences. Nowdays town has a Museum dedicated to the Imperial Palace, showcased small archaeological finds like famous gold coin 'solidus'; objects from architectural sculpture and a demonstrative model of the once imposing building, provide comprehensive information about the history of the area to the visitors of 'Majestic town' lngelheim. Town also has a range of other historical buildings worth seeing: Burgkirche; Ober-Ingelheim Old Town Hall; Bismarck Tower and many others including parks and manuments. 'Ingelheim Red Wine Festival' on the Burgkirche Fairgrounds, is held each year from the last weekend in September, is one of the popular and like many visitors I also don't want to miss it for sure. Ingelheim's fertile valley just not only famous with Vineyards for red wine but also widely known for high yield of asparagus fields with cherries and plums making this beautiful piece of Deutschland 'an economically impressive town'. High quality of living summoned to 'summer wine festival parade and winter Christmas tale' this scenic 'Ingelheim' equally parallelized by easy transport system of bus; railways with near by cities like Mainz, Wiesbaden, Bingen and Frankfurt Airport: the gateway to the world. Ingelheim also have fascinating super markets and shops, making living here; super cool. 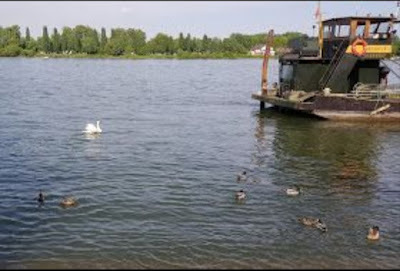 Thus how 'Ingelheim am Rhein' is continue to be attractive destination for visitors. 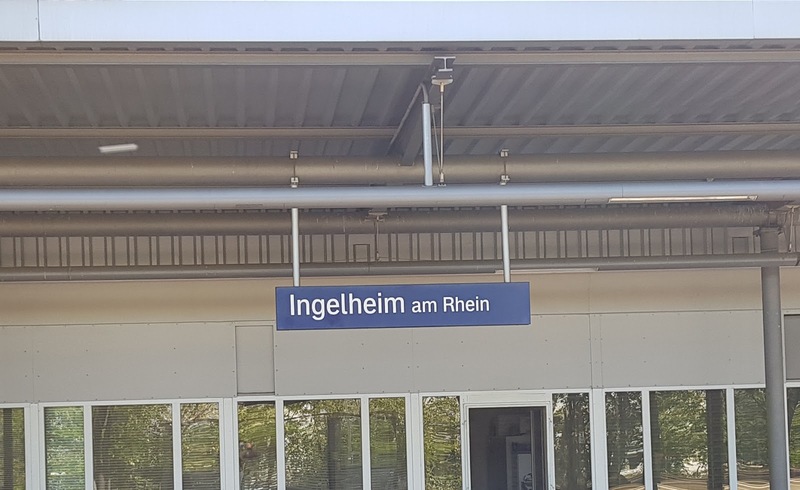 Well....along with all these quantitative information, warm greetings of known locals and those perfectly framed pictures of Ingelheim to be remain always with my memories. 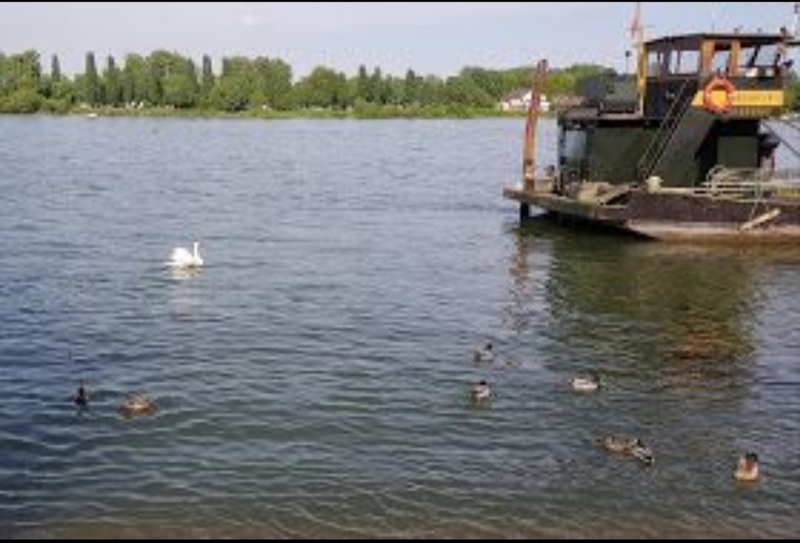 For few last days as 'Ingelheim resident' I have planned something mesmorising to explore : a travel through ship across the 'dreamy' Rhein river; along the town stretches, showing my kids fluttering swans, hiking excursion paths and scenic beauty of 'picture perfect Ingelheim'. You might be surprised, getting birthday wish few days after your birthday.....from none other than your own elder sister. This has a purpose. Family, relatives, friends and colleagues might have called up or messaged or even caught you right there to shower blessings on that auspicious day. Many of them might have brought gifts and sent cakes to express their affection towards you. Unlikely I am penning down ' an open letter ' to you. Because after this 'one day of every year' you might wait for next one to be felt special and to keep that essence of being special around you I would like wish you belated happy birthday repeatedly. This is not just a blog or letter but my blessings for your successfully happy life. I do believe that when we write something from heart to whom we love unconditionally, our blessings get locked inside composed words and whenever someone including you read it ; these blessings get unwrapped and work miraculously again and again. I know you also have same admirations and I absolutely love it when you express the same by sharing something of you to me. Though your remark about our age gap come in between. For me, having age gap; really don't matter because you could learn from my past mistakes to make better future choices and have someone to ask experimental things to proporous your life. Anyway difference in thinking drawn by 'age gap' couldn't put strong bond of sisterhood on threshold. You have witnessed, every endeavor and hardship I’ve faced and supported me; sometimes guided too. You are the 'one' to whom I can always confide in and trust. I will be always thankful. I also want to apologise for that time when I was not there to listen your side or hold your hand. I was busy in managing my family; rest of things you know.I do remember, many mesmerrisng moments of our together that help me when I was badly hurt and I never get carried away by them instead it made me strong. Dear sister, we just don't share 'divine parents' and 'sensible brother' but a bond beyond quotes. Remember people are born with their kind problems. Owing to many of cowards who blame destiny and people around for all ungratefullness; few being focused keep going to achieve ultimate goal ; so understand the process as you are likely to be one of 'few' and have very keen inner strength. You have charismatic persona that you built up yourself ; positivity and gratitude will make it long lasting. One last advice: Many times when things are not in our hand 'Win-win situation' could be a help. "Live up to the full extent of your beautiful life by shaking one hand to responsibilities and hold self-esteem by other one. "- Dad. Always with you to remind " you are too special". Blessed to love you sister. Its a 'Sand play' time. 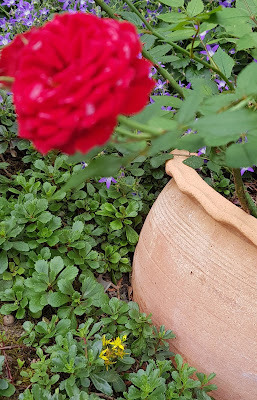 Contradictory to our sophisticated behaviour of holding things for long, by any means ; these 'sand granules' make us happy while releasing them through hands, willingly. My scenario of 'Sand play' got more expanded due to my kids. Both 7 years and 3 years olds love to play outdoors and me also wants the same as it's more worth than just watching T.V. and you tube videos for hours. So these kids are always ready with their gardening kind toy tools and me offcoarse, for play outings. Nearby garden serve them exactly :a good playground field with sliders, swings, rope climbing and one more 'fascinating play' : sand, making it not restricted to beach only. Absence of a shock absorbent surface in playground increases the risk of injury in a fall for kids. Accordingly, playgrounds are surfaced with a variety of good absorbing materials like sand as better protective layer as well as play zone. Safe sand with appropriate moisture content, surfaced up to few inches from playground so kids could enjoy their activities harmlessly. 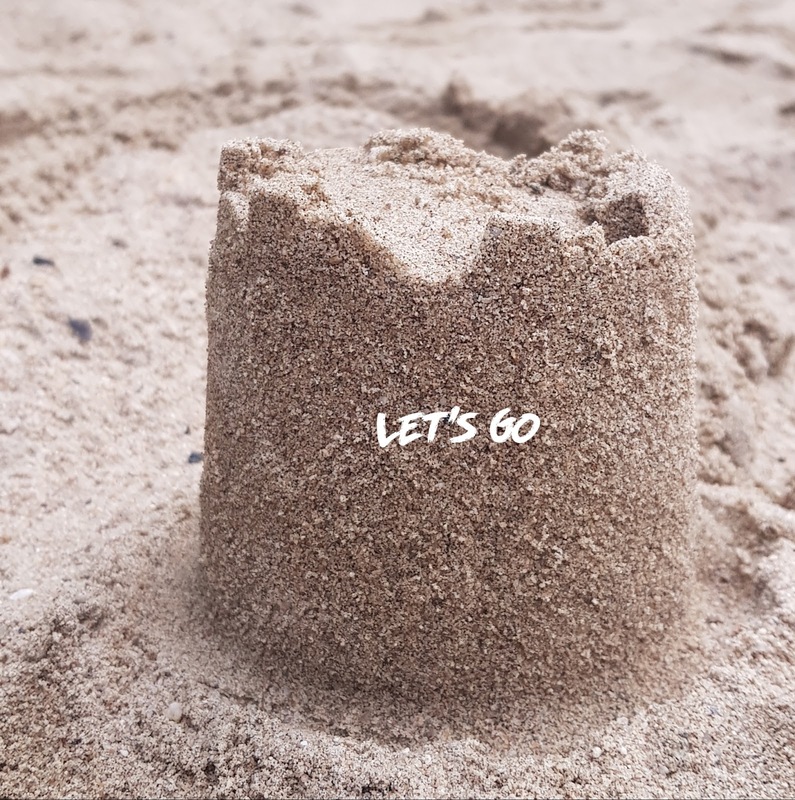 Making sand castles and miniatures buildings is the most popular among all age groups. Even my little one built up sand castle in few minutes and enjoy it like building ' a historical manuments'. Elder one also but now she is able to handle its destruction too. She loves to make sand houses and connecting their ways. Back time I have asked her what that means she smiled and told me she do built up her friends sandhouses along joined routes means they would be remain connected always : heart touching one. It was one of an impactful experience that how sand play helps kids creative, sporty and expressive along with social interaction. 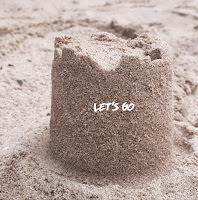 Thus 'the journey tale' of a sand from being the part of mountainous solid rock to the ' play toy' is amazing to tell to kids but for now I want my little one to learn to wait for her turn and share her stuffs with others and 'sand play' is the help. Whenever my eyesight catches glimpse of still, silent, an enormous sky covered with light blue coloured bedsheet that have moving feathery white cushions of clouds; my wandering thoughts just get lie down on it and cuddle with those 'cushions' to mold and carve them into different shapes through my imagination : I just can't resist this funplay as a hobby. Soon with open eyes that still resting on skybed I found myself into a half sleep dream that makes me fly high in the air with my thoughts.This place of high defined relief of being in self company takes me to another world where I do feel my internal existence through my thoughts. At this self-reliable state, these thoughts help me to find answers for those questions that might have been left unanswered in my brainy bag filled with daily deeds. "What should one do to feel own internal existence ?" 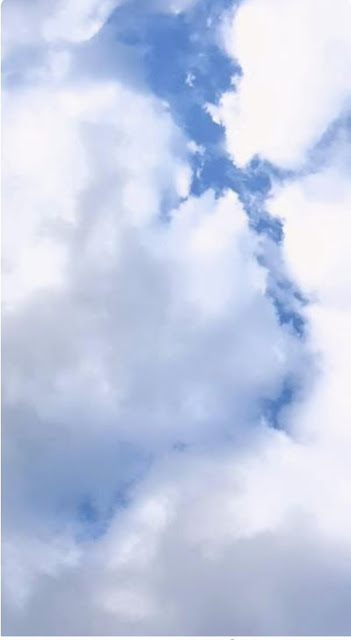 Considering external appearance 'mirror image' will get thumbs up but for internal existence to be felt one need to find other ways to get connect with himself except if he desire to. Just desiring can't be enough one must search the way accordingly ,with his own internal 'interest' which might led him to know the specific things about self while accepting limitations. Certainly there are many ways to get connect with ourselves : reading interesting books , writing articles and poems , travelling natural scenic places or historical sites , garderning wonder land and many other strange one, that all quite seems to be like our 'hobbies'. Yes, hobbies with which we can get along with ourselves and really can look through 'the mirror' that enable us to feel our existence for ourselves. Hobbies let us do something we love—something we don't have to do for any other or any other reason except that make us able to feel a rush of excitement and joy for own existence. Hobbies are often something for which we think to have tons of free time even with bussy schedule.Having hobbies are worth because of the many emotional, mental, pschological and physical benefits like stress management in today's bussy bee life and leading our mind to new ways of seeing the world. Hobbies are also our internal mirror replicas as by knowing them one can have introduction with himself as well as could bond with others too, so preserve and serve hobbies to have joy ride with your own artistic persona. What are my hobbies? One of them is quite strange and I have already shared it in very first para of this article. It helped me to get connect with my own thoughts to build up self aura and I need to be thankful about. Hmmm...In between this internal conversation, again I started my funplay hobby. This time I was shaping one of the cloud to look like my little 'Angel's face'. After a while I called her, "Come here. Look ...." But I lowered my voice soon as that sculpture of cloud resembled to her could only get recognised by an artist who carved it. Thanks to my 'hobby.